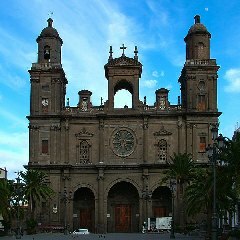 The Cathedral of Santa Ana (Holy Cathedral-Basilica of Canary or Cathedral of Las Palmas de Gran Canaria) is located in the old town (Vegueta) of Las Palmas de Gran Canaria. It is the seat of the Diocese of the Canaries in the Roman Catholic Church. You can go up to one tower and enjoy the views! Tower Opening times: Monday till Friday from 10:00 till 16:30h and Saturdays from 10:00 till 13:30h the price is 1,50€ pP.